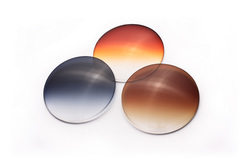 There have been many advances in lens coatings and we are proud to say that we offer them all! Polarised coatings to Essilor Crizal coatings. All designed to enhance your vision that extra bit more with your high quality lenses. Reflections from lenses make them more noticeable. Internal refractions within the lens ... ... can result in distracting reflections and "ghosting". These are particularly noticeable in bright sunshine or driving at night. Also, bright objects behind you can be reflected back into your eye creating a distracting double image. These reflections can be reduced by applying a special anti-reflection coating to the lens. This not only makes the lenses look more transparent but also helps to get rid of distracting reflections. It can also be beneficial when driving, particularly at night. Plastic lenses are nice and light but do tend to scratch quite easily. These scratches will reduce the quality of your vision through the lenses ... particularly under some conditions - like driving at night. To help protect your lenses, a thin coating can be applied to the lenses. This will help to keep your lenses in tip-top condition for much longer. Light from the sun contains a spectrum of wavelengths. We can see some wavelengths - the visible spectrum but we cannot see wavelengths such as infra-red and ultraviolet (UV) light. There is good evidence that too much UV light can damage the eyes. In particular, a small area of the retina called the macula can be damaged which affects the ability to read and see small detail. Excessive exposure to UV light can also cause the lens in the eye to go hazy - cataracts. Photochromic lenses automatically adjust according to the brightness of the light changing from almost clear to a full sunglass tint in the sun. This provides comfortable vision under all conditions and excellent protection from UV. Polarised lenses not only reduce glare like normal sunglasses ... ... they also have the special property of cutting out reflections from shiny surfaces. They are ideal if you like spending time near water. They are also great for driving reducing reflection from the bonnet and dashboard and wet roads. The polarised lens is sandwiched between two layers of material and the lens made to prescription.